Can someone positively confirm whether original 73 fastback engine mounts could be used on a 73 convertible? 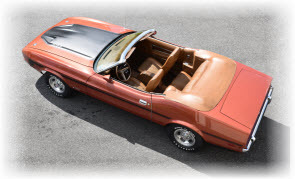 (05-11-2018, 10:07 AM)EBSTANG Wrote: Can someone positively confirm whether original 73 fastback engine mounts could be used on a 73 convertible? Not at my computer and my phone is down to 5% so I’ll quickly suggest to search “Motor Mounts” and look for posts by rackerm. He has done a ton of research on 71-73 motor mounts and perches (frame brackets). He has a number of great illustrations showing the difference between 71-72 vs 73’s and difference between vert’s and coupe/sportsroof applications. There are many variables here. First please clarify your question... "engine mount" you mean the 73 "captive" motor mount (insulator) and not the 73 frame mount (perch). What size engine? For 1973 year specifically 302 or 351C 2v and 4v used the same small block mounts , but there are different frame and motor mounts between hardtops (coupe/fastback) and convertibles. If you are swapping in a big block 429, the motor mounts are different. Interesting to note the frame mounts for a 71 429 big block are the same as the small block frame mounts used on 71-73 convertibles. In other words 71-73 convertible small block frame mounts are interchangeable with a 71 429 frame mount. With all that said, convertible frame mounts are taller and angled differently than the same year hardtop counterparts. Although the Ford part numbers are different, I have not seen a noticeable difference between the same year hardtop and convertible motor mounts (insulator). I have many pictures depicting these differences but I am traveling at the moment and can't post them.